Liz won the Spike Print Studio prize with her etchings and printed vinyl record prints, entitled Classics on Vinyl. 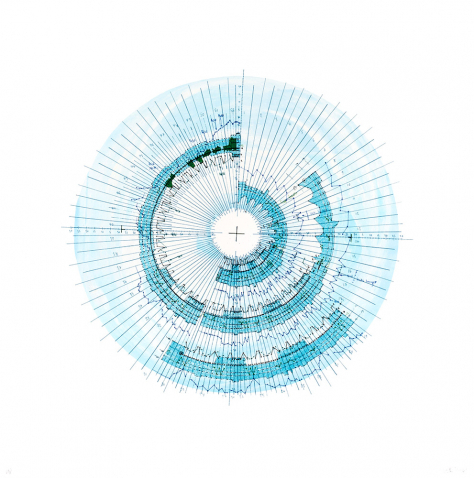 Liz Miller makes visual scores, inspired by original compositions, Miller maps sound and notation to create new circular scores which respond to pitch, dynamic and repeating motifs. Her use of colour also follows a system, continuing her investigation into circular organic pattern making. Map making and cartography are the basis of Liz’s art practice, from using traditional landscape formats to investigating concepts that are yet unmapped. 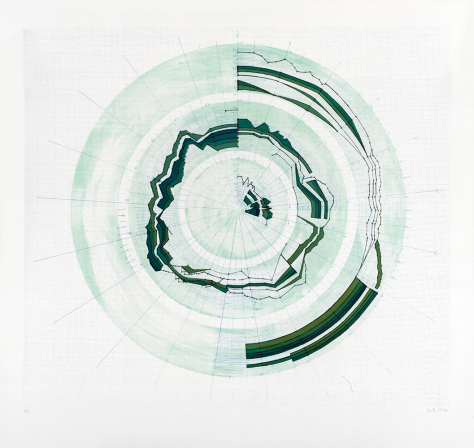 She mainly works with traditional print techniques (etching, lithography and screen printing) however other projects have included book-arts, large-scale drawings and land art projects. Liz Miller studied at Edinburgh College of Art and University of the Arts London. She began a three-year print fellowship at the Royal Academy Schools in 2013. Miller recently undertook a residency at Spike Island in Bristol, UK. Her work is held in the Tate Print Collection and the British Library.